We provide public relations and investor relations services to private and publicly-held businesses in the United States and abroad. Our consultancy's view is straightforward: Only seasoned professionals who work in your best interests, under a pre-determined plan, with quantifiable results. Could we help you achieve your strategic goals? with CU Content (Fall, 2015). in the O'Dwyer's PR Blog (April 28, 2015). and reputation rebuilding in a Forbes.com commentary (October 20, 2014). and the "Bridge" fiasco (January 9, 2014). Seitel tells CNN (July 10, 2013). Fraser Seitel tells the CBC (July 10, 2013). with The Conference Board Review (Spring 2013). on Fox Business (January 4, 2013). in the O'Dwyer's PR Blog. with Fox Business (July 9, 2012). in the April 19, 2012 Banking New York. in the Spring 2012 Conference Board Review cites Andrew Edson and Fraser Seitel. in the John Adams book, “In the Trenches” (February 2012). with Fox News’ Shepard Smith (October 26, 2011). in Credit Union Business (May 2011). Industry pundit Jack O’Dwyer reviews it (September 30, 2010). SOCIAL MEDIA AND IR...WHO NEEDS IT? Article by Andrew Edson in the August 2010 issue of O’Dwyer’s. amid the oil disaster (June 7, 2010). and draws comparisons to the infamous Exxon Valdez spill (June 1, 2010). by Senior Partner Fraser Seitel (November 30, 2009). Fraser Seitel comments on Sarah Palin’s book from FOXNews.com. Edson tells the O'Dwyer Report (June 19, 2009). Edson tells the Mann Report (September 2008). Fraser Seitel weighs in on the Presidential candidates on Fox News. - Democratic Party's nomination of Barack Obama. - John McCain's Next Move. 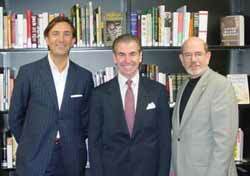 on October 16, 2007 at Laboratory Institute of Merchandising, the Manhattan-based college for the business of fashion (www.limcollege.edu) at classes taught by Adjunct Professor Barry Zusman (right), a senior counselor at the firm. Flanking Seitel is Milan Milasinovic, chairman, Marketing Department. Perhaps coincidentally is that Seitel’s book, The Practice of Public Relations is the required text. discusses White House PR with WNYC Radio’s “On the Media” program on July 20, 2007.
a new book published in May 2007 by Boston-based Aspatore Books (www.aspatore.com). in the winter 2007 issue of Cheklist magazine. in the July 2006 issue of O’Dwyer’s PR Report. commentary by Andrew Edson in the summer 2006 issue of Cheklist magazine. as seen on FOX News Channel regarding the 'Bank of Opportunity'?